Dont lose your target records and notes. Insure your records are in order and readable by keeping these detailed note pads. How many times have you shot good groups but forget to document it. 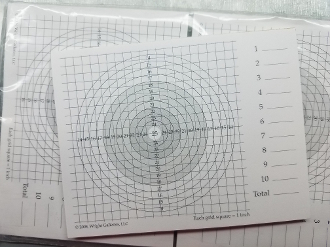 This is a very inexpensive way to keep good records of your target shooting and load development. It's also a good tool for Schuetzenmeisters who need a Target Pad in their pocket when running the line to keep track of the inevitable mistakes made during the match. Several of these target pads need to be in your shooting box. 50 pages to a pad.